Orgrim Doomhammer gave this legendary weapon to Thrall. His name is a total coincidence. 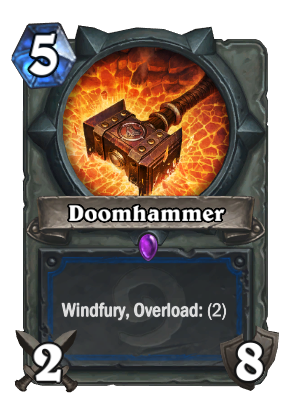 I got a golden Doomhammer in a pack. I want to dust it, but don't have a standard one. Should I rather wait to get a standard one? If you're going to use the card in a deck, then I'd hold onto it. If you don't plan on using it at all, then go ahead and dust it. Personally, I prefer to hold onto cards until I have two copies to put into decks. No, it doesn't belong in the Museums! Can someone explain to me why this card is good. It is a five mana four four weapon where you take double damage from minions with overload two. Please no downvotes, i just don't understand. A few reasons. First, it has great board control. Windfury enables the shaman to take out twice as many small minions per turn than, say, Warrior with Fiery Win Axe. Your health, which may go down more, can be protected by the Shaman's numerous taunt minions, giving you board control as well as protecting yourself. Second, the effectiveness with Rockbiter Weapon. 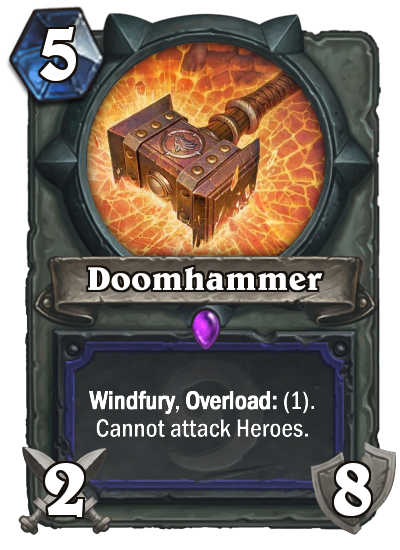 While it did receive a nerf in the last big patch, RW is still a great card, and 2 Rockbiter Weapon + Doomhammer Turn 9=16 face damage. Over half of the opponent's health. And finally, it looks FREAKING EPIC. This is just absurd with it's board control, aggro, and combo potential. At eight durability it can just change the course of a game, especially when mixed with some attack buff cards and/or removal for creatures it can't bash well. Either Rockbiter needs a nerf, or this. One good way to nerf this is to change the durability from 8 to 6. This is pretty much SkillHammer. My take on nerfing this weapon: Reduce Overload by 1 or remove it completely and make it cannot attack heroes. A weapon with Windfury is interesting, yes. But then, there's Rockbiter Weapon and everybody lose their minds. Alright guys, it's cool, we can nerf it now. C'mon guys, seriously.